Computer chips are getting smaller and smaller. USA - Intel, the world's biggest maker of computer chips, has achieved an average feature size of just 65 nanometres for its next generation chip. The memory cells produced are half the size of the most advanced manufacturing technology in use today. If the chip is manufactured by 2005 as planned, it will ensure that the number of transistors engineers can cram into a given area will continue to double every two years. This trend is known as Moore's Law, after Intel co-founder Gordon Moore, and has held for the last 30 years. But recently experts have suggested that the problems of current leakage and heat build-up, which increase as chips shrink, could finally break Moore's Law. Getting around these problems has become the number one priority for chip makers. This is because smaller transistors mean speedier chips - electrons need not travel as far - and lower costs, as more transistors can be made from the same size of silicon wafer. The new 65-nanometre technology points to the continued robustness of Moore's Law. "The 65-nm process will enable us to make better products at lower cost," says Sunlin Chou, senior vice president of Intel's Technology and Manufacturing Group. The new chip is a static random access memory (SRAM) cell. This a faster, more reliable alternative to dynamic RAM. SRAM cells made by a 90-nanometre process first used in manufacturing in 2003 measure one square micron. In contrast, the new 65-nanometre process produces cells that are only 0.57 square microns. The SRAM chip relies on technologies Intel has used to preserve Moore's Law before. This includes strained silicon, introduced for the 90-nanometre chip, and copper interconnects, introduced for the 130-nanometre chip in 2001. Intel says that 70 per cent of the equipment the company uses to produce its 90-nanometre technology can be re-used for the new 65-nanometre technology, avoiding price hikes. 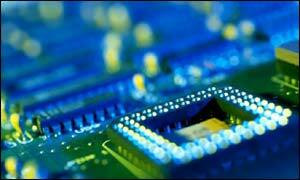 Other chip makers say they are also on track to release 65-nanometre technology soon. "I think we're all marching to the same timeframe," IBM spokesman William O'Leary told the San Francisco Chronicle. Dean Freeman, an IT analyst at Gartner Dataquest in San Jose, California, notes that every time it has looked like current leakage and heat dissipation will "strangle" Moore's Law, technology has found a way around it. yea i'd need that new stuff. the pc i got here is 2ghz cpu, 256MB ram, geforce4mx graphics card and soundblaster live audio card. but my pc keeps freezing up coz its low on vitual memory. jj do u noe how i could fix it?? RAM is dirt cheap now. Order it online for next to nout. As to your virtual memory settings, what O/S are you using and how big is your hard disk and how much free space have you left on it. The common setting with win98 and XP is for people to allow the operating system to manage the virtual memory for them but if your hard disk is running low on free space then it will limit the amount of virtual memory available. Also check to see what processes are running in the background to find out which ones are using up the memory. whoah how do you that!